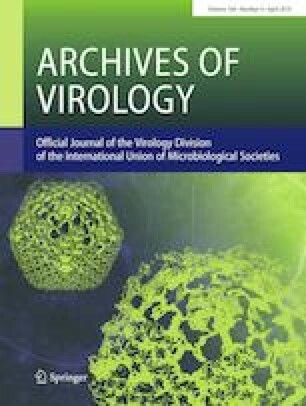 A new double-stranded RNA (dsRNA) virus named Alternaria alternata botybirnavirus 1 (AaBRV1) was isolated from Alternaria alternata strain SD-BZF-19, a phytopathogenic fungus infecting watermelon in China. The genome of AaBRV1 consists of two dsRNA segments (dsRNAs 1 and 2), 6,130 and 5,862 bp in size, respectively. The sequence contains two putative open reading frames (ORFs) which encode two polyproteins of 1,874 and 1,784 amino acids, respectively. Nucleotide sequence comparisons revealed that the two ORFs of AaBRV1 have the highest similarity 60.3% and 56.7%, respectively, with dsRNAs 1 and 2 of Botrytis porri RNA virus 1 (BpRV1). The two polyproteins encoded by dsRNA1 and dsRNA2 shared the highest amino acid identities with the cap-pol fusion protein (60.2%) and hypothetical protein (53.7%) of BpRV1, respectively. AaBRV1 is composed of isometric particles, approximately 35 nm in diameter. Phylogenetic analysis of the RNA dependent RNA polymerase (RdRp) domain of the polyprotein revealed that AaBRV1 clusters together with members of the genus Botybirnavirus. These findings support the discovery of a new botybirnavirus in A. alternata. The online version of this article ( https://doi.org/10.1007/s00705-019-04189-x) contains supplementary material, which is available to authorized users. This work was financially supported by Beijing Innovation Consortium of Melon Research System (Grant No. BAIC10-2019).